How would you like the chance to run the Jelly Belly Candy Company for a day? I sure would lol.. Well, Jelly Belly is holding contest “The Big Bean” and it is free to enter without purchase. Below are ways that you can enter. Of course more ballots = more chances to win! 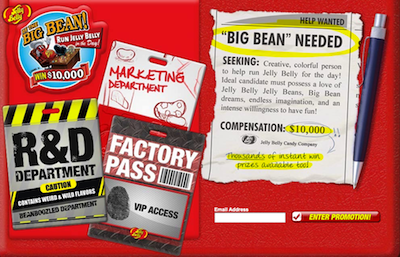 You’ll get 1 extra sweepstakes entry the first time you visit the Factory Game, submit your first Jelly Belly jelly bean flavor and its BeanBoozled counterpart, and 1 extra entry the first time you visit the Marketing Department. Tell friends through this site and get 1 additional entry with each friend you tell!. Get 2 BONUS entries when you complete all three of the departments! A trip for four to the Jelly Belly Factory and $10,000 cash! Take your shot for the chance to win one of thousands of great prizes instantly. Each day you log in to the promotion, you will receive a new Instant Win game play. Create a tasty, real Jelly Belly jelly bean flavor and its BeanBoozled counterpart and you could win a brand new Wii Kit with the Ballistic Beans game. Design a Box of Jelly Belly jelly beans and then share your creation with your friends! Play the Jelly Belly Factory Game – keep up with all the orders as they come into the factory and make sure the Jelly Belly packages get to the shipping department in time!